Ace2Three, the premium online rummy website has announced some big tournaments to celebrate Champions Trophy Cricket 2017. 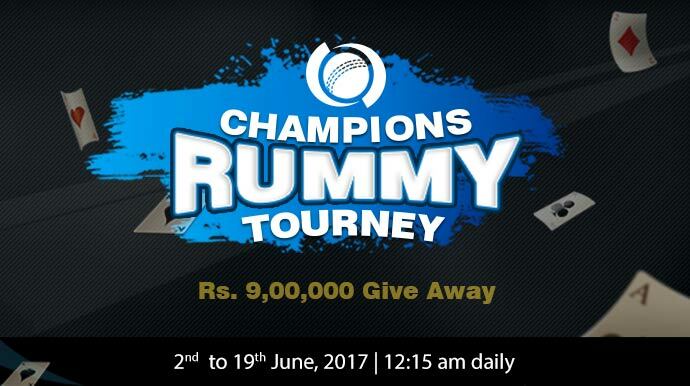 The rummy tournaments named Champions Rummy Tourney will run from 2nd to 19th June midnight with a maximum of 10,000 premium players. The top 500 players from these rummy tournaments will win cash prizes worth Rs.9 lakhs. If you play at Ace2Three according to online Indian rummy card rules, this is perfect chance to earn some real cash while you cheer for India this CT17 season. Sign in to your account now and play like a champ to take home big cash prizes! The Champions Rummy Tournaments from Ace2Three will run every midnight on 12:15 AM from 2nd to 19th June 2017. All the premium players at Ace2Three Rummy are eligible to join these tourneys for free. The games will run in Stakes Format with a maximum of 10,000 players. Only the top 500 players will be rewarded with cash prizes from a promotion prize pool worth Rs.9 lakhs. If you are not yet a player playing with real money, you can easily become a premium player at Ace2Three by making a minimum deposit of Rs.100. Once you have done your first deposit, join a cash rummy table and play at least a game. You will be eligible to join all the exclusive promotions and tournaments available for premium players once you have started playing real money rummy games. If you are a new online rummy player and want to know more about this website before you register with them, read our review on Ace2Three Rummy. Also, subscribe to us and get the latest news on 21 card rummy game rules, rummy tournaments, promotions, bonus offers and cash back deals.